This fun video comes to us via John Stangeland of Atlas Comics in Norridge, Illinois. And guess what? It was sent to John by longtime hayfamzonder Joe Lenius. It slides by so fast that I had to watch it a couple of times to see everything that was going on. Enjoy! Jeanette has done it again! Here's the recipe. Take a picture of a 1971 Jack Kirby splash page to Jimmy Olsen #143 which is in The Hayfamzone Collection, watch Jeanette add her Photoshop magic, and stand back while it all gets stirred together. Delicious! You can see this artwork in its original static form over here. And if you'd like another peek at the published comic covers that Jeanette animated, they're right over here and here. The Hayfamzone is Coming to C2E2! Let me repeat that headline. The Hayfamzone is coming to C2E2! You are not hallucinating! This is not a dream or a hoax and it's certainly not an imaginary story! The fine folks over at the C2E2 Convention Programming Board have scheduled a One Hour Panel for me to discuss and present all things hayfamzone. And you are invited to come and participate! "The beloved hayfamzone comicblog will jump from virtual reality to three dimensions for this C2E2 Special Presentation. Watch as Brian Hayes, both the caretaker and an inmate of the hayfamzone, will delve more deeply into topics that have been broached over on www.hayfamzone.com. Can it be true that the Secret Origin of the hayfamzone will be revealed at long last?" I am not making this up. Pinch yourself and you'll see that you are wide awake. It's all true! Look over here and you'll see for yourself, and www.C2E2.com can provide more general information about the C2E2 Convention. Something so unprecedented in the glorious history of the hayfamzone is coming that I thought I had better give you a little head's up about it. Please check back tomorrow for an important announcement that you could never have anticipated! 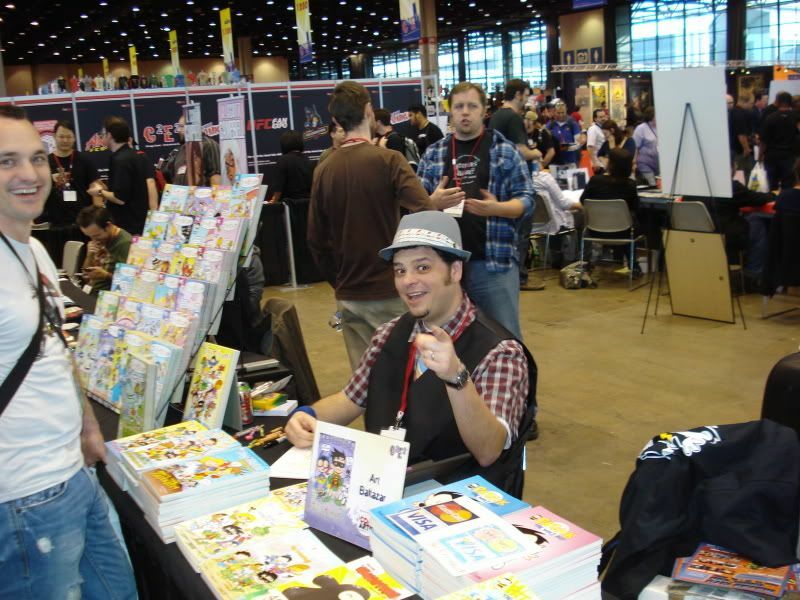 Let me tell you the history of medium to large comic book conventions that have been held in Chicago through the years. Back in the mid-1970s there was a monthly gathering of The Old Comic Book Club of Chicago in the YMCA Hotel on South Wabash Avenue. The event was held in a large ballroom on the second floor but there was just that one dealer's room and certainly no guests or speakers. Still it was much fun and I bought many comics and pages of original art there and, a few times, my comic buddies and I even chipped in together for table space and sold off a few of our unwanted items. For the first decade-and-a-half the gathering was called The Chicago Comicon and it took place in large hotels. In 1993 new ownership changed the name to WizardWorld and moved it to a suburban Convention Center. It was a pretty good convention with lots of great guests all along. Until three years ago. An upstart named C2E2 was a new convention determined to joust with the behemoth, and it met in the legendary McCormick Place Convention Center. DC Comics and Marvel Comics among others jumped ship and patronized C2E2, abandoning WizardWorld (if it's still called that, I can't tell for sure). I snapped the photo above at C2E2. WizardWorld rustled up entertainment-type guests to fill the void. I did enjoy seeing Adam West and Burt Ward and Brent Spiner appear on panels, but WW now seemed far less like a comic convention than a media convention, since the big publishers were not in attendance. 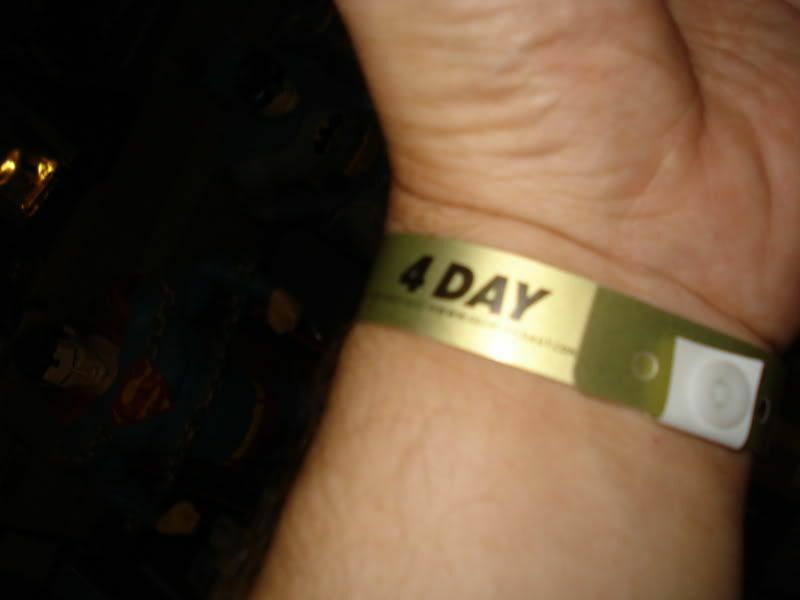 To add insult to injury, weekend-pass-holders were required to wear their identifying wristband continuously through the weekend. Huh? I did the unthinkable and snipped mine off the first night and was roundly chastised the next day when I requested a replacement. Why not just a slave collar around the neck? There's a new comic book store opening soon, and it's called Aw Yeah Comics. Where have you heard that phrase before? Where else? Aw yeah, Art Baltazar! Mr. B is opening his store in Skokie, Illinois, just minutes from one of my schools. Hooray for Skokie! More details about the store can be found over here. Let's see if we can name all of the comics professionals who own retail comic stores. There's Geoff Johns, of course. We know from TV that Kevin Smith owns one. I think Mike Richardson of Dark Horse Comics used to have his finger in the pie (and maybe still does). 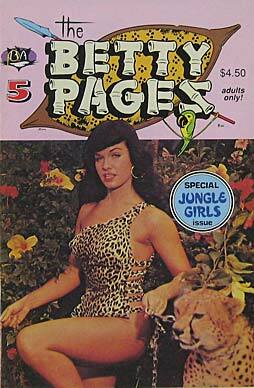 And perhaps Tony Isabella? I'm counting on you to let me know if I'm forgetting any. Do you see that big guy looking down on us from up there? Say hello to Action Cat, a mascot of the new store! And good luck to Mr. Baltazar in his new venture. Joe Simon and Jack Kirby's Sandman ruled the realm of dreams in his 1940s stories in Adventure Comics, and Simon & Kirby delved deeper into the topic in their Strange World of Your Dreams series in the 1950s. Dreams (together with hoaxes and imaginary stories) were an every-month occurrence in Mort Weisinger's Superman family of comics in the 1960s. And of course Neil Gaiman's Sandman raised dreams to a new level of cool starting in 1989. Chicagoan Sarah Becan mines this same rich ore in her Shuteye. 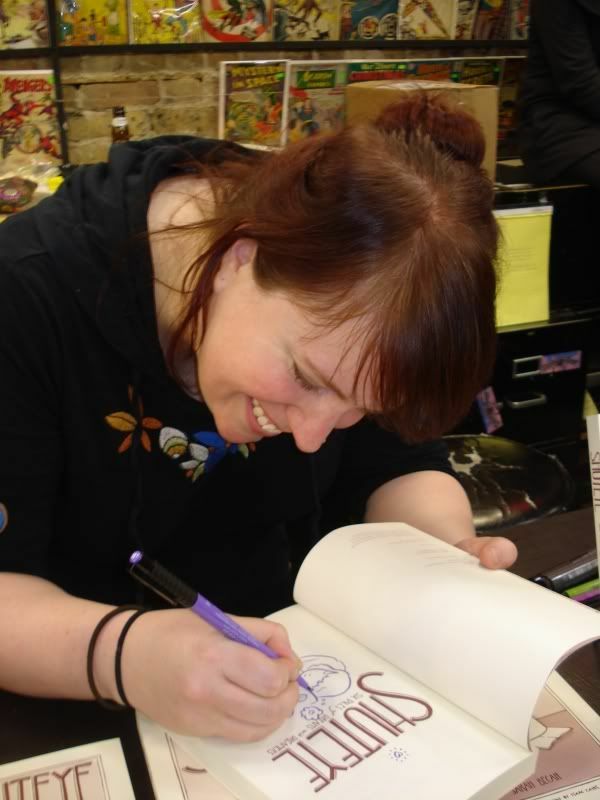 Originally self-published as mini-comics, the series has been collected in a softcover edition thanks to funding Sarah got from her fans on Kickstarter.com. The book is beautiful, and the brown tones of shading make the artwork very welcoming. I especially like how there are pages devoted to showing the character of one chapter morphing into the character of the next chapter. 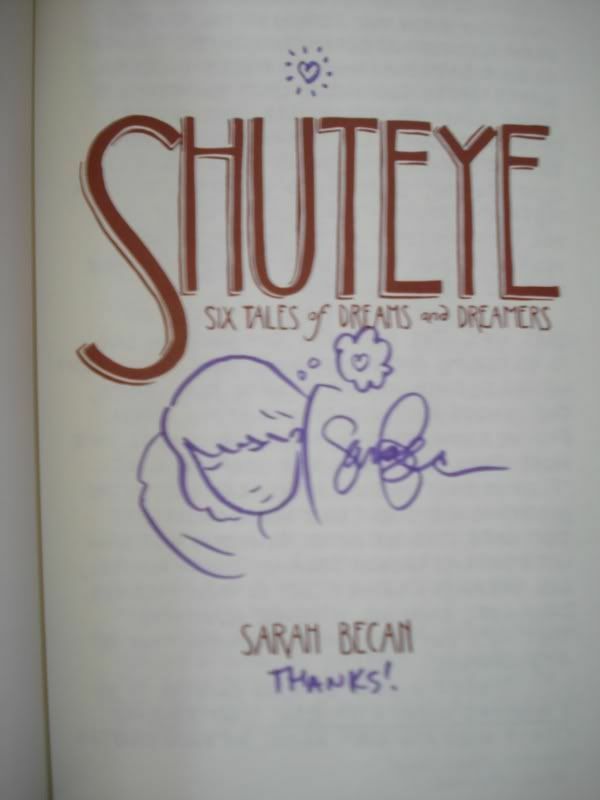 It was a pleasure meeting Ms. Becan at her recent signing at Chicago Comics. I found out that Sarah is a big fan of brush markers, as I am. And home-baked cookies for everyone! You'll want to visit http://www.sarahbecan.com/ for more information. It was announced yesterday that writer Mark Waid is selling his comic collection in order to fund a venture involving online comics, also known as digital comics. I don't like to read comics from a computer screen. A big part of the comics milieu to me is to feel the paper and turn the page. I like paper! Somebody must like the digicoms though, because more and more of them are becoming available. I've been asked the following: if printed comic books become extinct and if the only way new comic stories can be read was online, would I then become a convert to the cause of the digicoms? That is a good question. I remember sitting with Poth Jeanette and Prince Catt in the audience of a comic convention panel and listening to Mark Waid tell the story of when he moved to Florida to work for Crossgen Comics. He hired movers to transport his comic collection and, so voluminous was that collection that the movers categorized him and his comics as "a family of five." Curious, I sent a direct tweet to Mr. Waid yesterday. I asked if he was selling all of his comics or just some of them. He responded, "All. Every last one." To me, this sell-off is a stunt, much like DC Comics deciding to start the numbering of Action Comics over after 70 years with a new number one issue. Stunts do garner attention, though, and Mark Waid has earned himself coverage right here on the much-revered Hayfamzone Blog. I've always liked the work of Mark Waid, dating all the way back to when he was the "boy editor" of Secret Origins for DC in the 1980s. His current Daredevil is one of the very few Marvel Comics series that I read. Though he and I part ways when he branches off into the abyss of digital comics, I wish him well in his venture nonetheless. That crazy bird in the television commercials was always telling us he was Cuckoo for Cocoa Puffs, and last fall that same bird was putting nice little comic books into his cereal boxes! Unfortunately you won't find the comic-filled cereal boxes on the shelves anymore. (If by some miracle you do stumble upon one, be sure to pluck out the comic and then discard those too-old Cocoa Puffs!) But, if you'd like, you can look at the online continuations of the four Justice League stories by visiting www.BigGCerealHeroes.com . Exhibit A is a 1975 Flash cover drawn by Ernie Chan. But wait. I believe he was still known by the name Ernie Chua at that time. I can understand a name change from "Chua" to "Chan" if it was supposed to be Chan all along but some mistake had been made. Likewise, I can understand changing "Datsun" to "Nissan" if it was supposed to be Nissan all along. But why change "Berni" to "Bernie?" And why change "Betty" to "Bettie"? Mr. Wrightson and Ms. Page must have had personal reasons for those transitions, and I have wondered from time to time what those personal reasons could have been. Here is an interesting artifact from French television in 1972. Joe Kubert and Neal Adams and Moebius produce jam drawings on very large sheets of paper. If I had been there as part of the support crew I would have handed each of the guys a fresh marker that wasn't quite so dry! Harry Mendryk and I have never met in person but we have been web-acquainted for a number of years. I first learned of Harry by name when I stumbled across his wonderful Simon and Kirby Blog. He posts there once a week and I learn something from him every single time (such as how to easily spot when a Golden Age lettering job was the handiwork of Mr. Howard Ferguson). Harry told me after the fact that he and I had bid against each other on ebay for this 1974 production art to Jack Kirby's Sandman #1 cover. You may have some of Harry's work in your possession and not have realized it. He has gained due acclaim for his Photoshop work reconstructing the color art for beautiful reprint editions of Golden Age comics and also of some Silver Age comics. 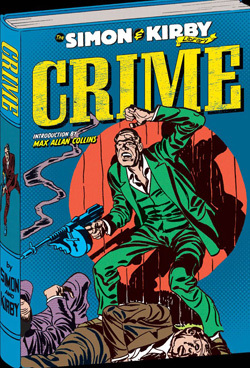 You can find his name on the credits page of The Simon and Kirby Library of Crime and The Jack Kirby Omnibus Volume I and many other books. Along the way Harry became very close friends with comics legend Joe Simon, and readers of Harry's blog have been treated to many unusual artifacts they would not have been able to see anyplace else. For example, the artwork gracing the top of this article was drawn by Mr. Simon for his high school yearbook! To see more drawings in that same series or to see hundreds of other interesting items and articles, I encourage you to visit The Simon and Kirby Blog. It's right over here. Art Baltazar is great. Poth Jeanette and Prince Catt and I have had the pleasure of chatting with him in the Artists Alley of a number of different conventions for a number of years. And Mr. B was the subject of one of my earliest blog articles, over five years ago! 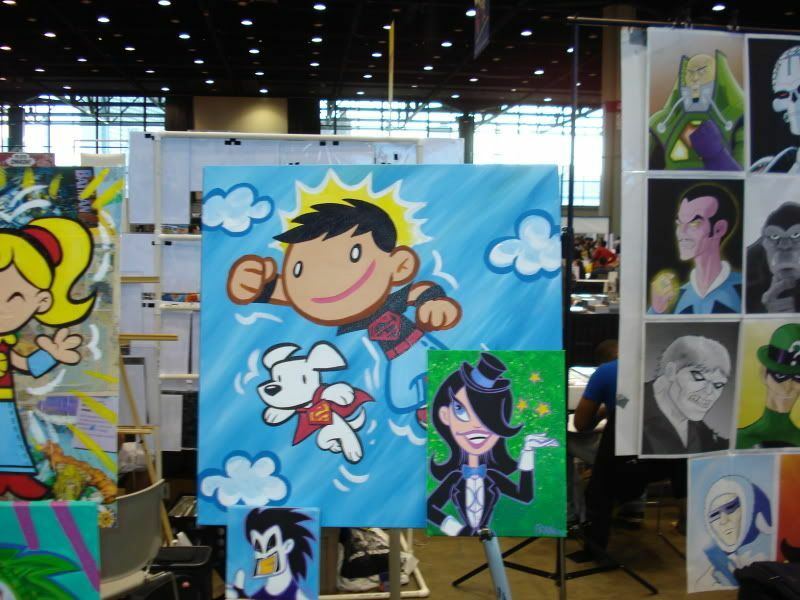 Above is a picture I took at the first C2E2 convention back in 2010, and the picture down yonder shows some of the paintings the gent was displaying that day (and don't worry! He told me he didn't mind me taking the picture). I just heard today that Tiny Titans is being cancelled. That is a big, steaming drag. Month in and month out for four years, tt (not to be confused with TT which is reserved in many people's minds for the Teen Titans) was one of my favorite comics in the pile. I remember that I got such a kick out it the first time Hoppy the Marvel Bunny appeared (without even being identified by name). Oh well. I know the upcoming Superman Family project will be great also. Not one to squander his social networking connections, Mr. B is giving his online friends quite a bit of content lately. He publishes a daily online newsletter entitled Aw Yeah News! and he also presents The Aw Yeah Podcast with Art & Franco. Somebody's keeping busy! What's that? You say you'd like to see more of Mr. B's artwork? Okay, okay, I'll give you another look at the little paintings that I have hanging in my comicartfans.com gallery room. And whenever you want you can do a google search and see as much artwork as you'd like. Aw yeah! This Garbage Can Attacked Me! The garbage can pictured above looks like one of the sedate, well-behaved ones. Don't let it fool you with that act he puts on! It's like when you watch Boris Karloff singing and dancing on The Red Skelton Show and you just know that's not the real Boris Karloff. * Sure, the can above is nonchalantly resting against that building, but you're seeing it only after I had pushed up to that perch following its ATTACK on me! Last week it was windy in Chicago for a couple of days. Really, really windy. I was side-by-side with my car in a parking lot when I heard a loud scraping on the ground. I turned around to see that sinister receptacle, on its side, coming directly toward me along a straight line. My immediate thought was, "I'm in a movie, and this is a special effect." It was as if I were Magneto or Cosmic Boy and I was summoning the object toward me with my amazing powers. The garbage can gently kissed my car's rear bumper and the director yelled "Cut!" 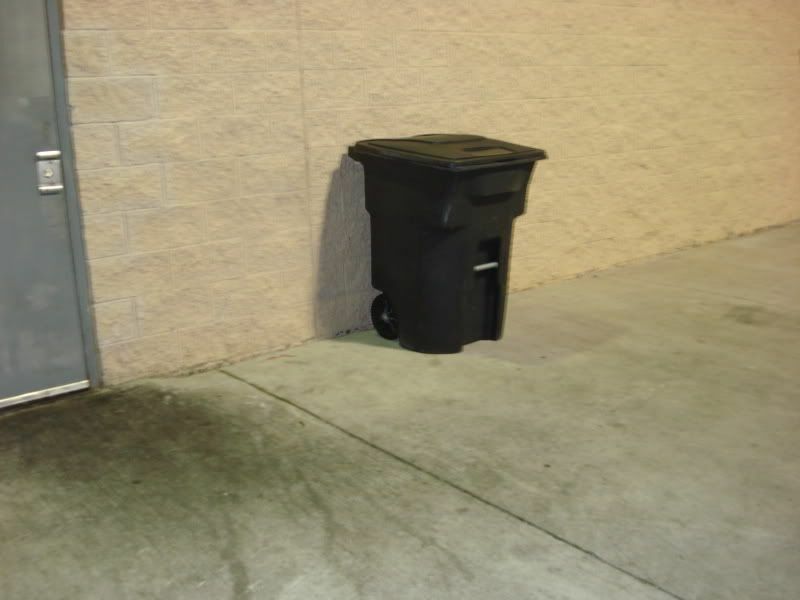 As I righted it and pushed it back, I noted that the garbage can was heavier and more solid than I would have thought and I realized that it might have done a little damage if that killer wind had been pushing it along just a bit more swiftly. * Many thanks to Ralph Kramden for the Red Skelton corker. Thanks to @ColonelTribune for sending this Venn diagram around. I invite you to follow @hayfamzone and receive the early alert every time a new hfz post is published! This morning saw the debut of the weekly DC Nation animation block on Cartoon Network. I liked it! The computer animation on Green Lantern seems ideal for that series and it is strikingly beautiful. Young Justice featured Witch Boy and his cat Teekl as the antagonists and it's always a pleasure to see the creations of Jack Kirby extend their reach. The minute or two of Plastic Man was a fun trifle, but I could have done without the clay-faced and British-child-voiced superheroes in the other short. Something had led me to believe that DC Nation was going to be a ninety minute block of cartoons so I was a little disappointed to see it end after just one hour. But enough quibbling. As I said, I liked it! In the late 1970s, actor Nicholas Hammond starred in a Spider-Man live action series. I never watched a single episode and I have no regrets about that. Well, somebody had the idea to mash together footage from that BB episode with footage from the Spider series. The video attempts (not all that successfully) to suggest that Spider-Man himself appeared on The Brady Bunch (or, rather, that the BB appeared on an episode of Spider-Man). You can see the result for yourself over here. It's not great but, here in the hayfamzone we dish out the bad with the good in our attempts to keep you well informed!